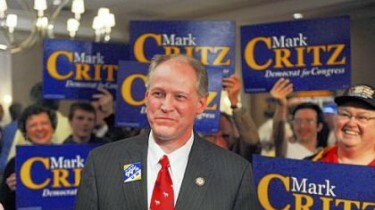 Pennsylvania Democrat Rep. Mark Critz blasted Obama today after his Ohio economic speech. President Obama’s big economic speech in Cleveland failed to impress one endangered House Democrat, Rep. Mark Critz (D-Pa.), who took him to task for his economic and energy policies. The statement — which was blasted out by his campaign — shows how toxic Obama is in parts of the Rust Belt, especially in a Republican-leaning district with a high level of steel and coal production in southwestern Pennsylvania. Critz has bucked Obama since he got into office — he has said he would have voted against climate change legislation and Democrats’ healthcare reforms — but this is one of his most public rebukes to date. The Political Press Corps also gave Obama a thumbs down today following his speech.